Following in Chevrolet’s recent propensity for producing vehicles traditionally outside its established sectors, the Equinox presents itself as an entry work checking out in an already crowded midsize crossover SUV market. Larger and roomier than many of its chief rivals, the Chevrolet Equinox enters the 2017 model year with the intention of closing out the second production cycle. As a result, all features are optimized, especially considering that the vehicle had received a major update the year before. However, the top-level trim is no longer the LTZ, but the Premier. It joins the other trims, which are the L, LS, and LT. The 2017 Equinox gets standard aluminum wheels, although they are 18 inches on the Premier, while being 17 inches on the other trims. Other standard exterior features on the vehicle include a rear wiper, projector-beam halogen headlights, daytime running light (DRL) ability to increase conspicuity to other drivers, a chrome-surrounded black grille, and power-adjustable manual-folding side mirrors. The DRLs on the LT are LEDs instead of halogen bulbs for a longer duration, and the glass is deeper-tinted. Also, with the LT and higher, Chevrolet adds roof rack rails for added cargo carrying capacity, and the side mirrors can be heated. The Premier stands apart from the other models with its front fog lights for more penetrating light. With two rows of seats that accommodate up to five people, the 2017 Chevrolet Equinox offers 99.7 cubic feet of passenger volume. The rear seatback is foldable, thus giving you the opportunity of extending cargo space from 31.5 cubic feet to 63.7 cubic feet. On the Premier, Chevrolet spices things up with 8-way power adjustability on the driver’s seat, leather seat trim, and front-seat heating capability. Base-level interior features include electronic cruise control, a Bluetooth hands-free phone system, remote keyless entry, a Wi-Fi hotspot for 4G LTE Internet access, and a six-speaker audio system with a 7-inch color touchscreen. On the LS, Chevrolet introduces a complimentary three-month SiriusXM satellite radio subscription. The LT and Premier also get Chevrolet MyLink, which integrates vehicle functions at the color touchscreen. The feature comes with a CD player with MP3 and WMA playback capability, as well as Bluetooth-enabled audio streaming. The Premier’s unique features include auto dimming on the rearview mirror, a remote vehicle starter system, and automatic climate control. 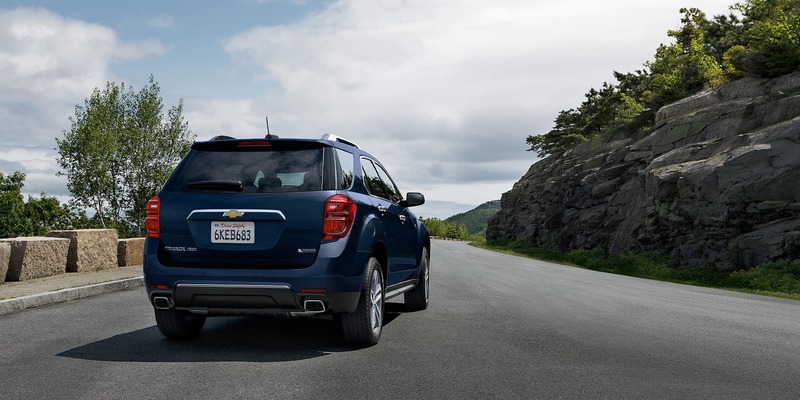 The new Chevrolet Equinox has a suspension system that is supremely designed to handle the roughest of driving surfaces. The front has a MacPherson strut configuration, with a stabilizer bar, optimally tuned shocks, and hydraulic-ride bushings in the control arms. The rear adopts an independent multi-link design, which also includes a stabilizer bar and hydraulic bushings. If you get the optional higher-level engine, Chevrolet would upgrade the steering with electric power. This promotes better fuel efficiency, since power will come from an independent source, rather than the engine. There are two drivetrain choices: front-wheel drive and all-wheel drive. However, the base-level L is restricted to the former. The standard engine on the 2017 Chevrolet Equinox is the LEA, which is a 2.4-liter inline 4-cylinder that generates 182 horsepower and 172 lb-ft of torque. If you choose the LT or the Premier and go with the all-wheel drivetrain, you can opt for the larger and more powerful LFX instead. The LFX is a 3.6-liter V6 that pumps out 301 horsepower and 272 lb-ft of torque. 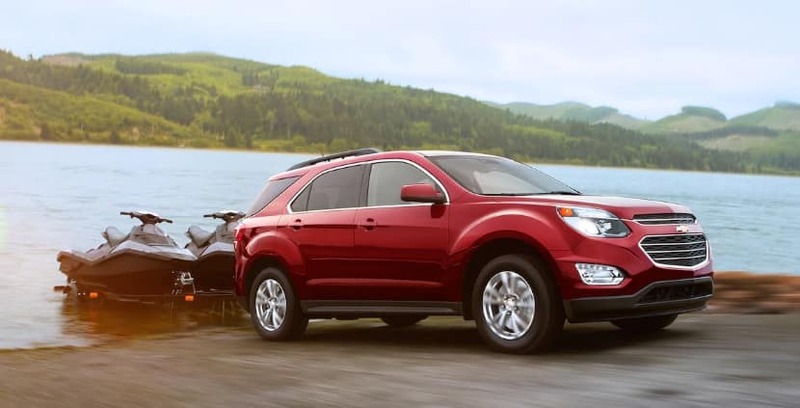 Regardless of engine, the Equinox comes with a 6-speed automatic transmission with overdrive and electronic range select, and it can tow up to 1,500 lbs. To ensure safety in the event of a car crash, the 2017 Chevrolet Equinox comes with a pair of front impact airbags that face the driver and front passenger, side impact airbags installed on the front seats, and roof-mounted side impact airbags that flank both rows of seats for head protection. Courtesy of parent company General Motors, Chevrolet provides the OnStar communications system with the Chevrolet Equinox, which comes with two complimentary subscriptions: the five-year Basic Plan, which includes advanced diagnostics and dealer maintenance notification; and the three-month Guidance Plan, which offers car care services like stolen vehicle assistance, automatic crash response, and roadside assistance. Disc brakes are on all wheels for optimizing response to brake pedal pressure, and it comes with anti-lock braking to prevent wheel lock-up during sudden stops and brake assist for added stopping capability when necessary. Also standard on the Equinox are StabiliTrak for electronic vehicle stability, traction control for maximizing tire contact with the road, a rear vision camera for flashing a video image when moving in reverse, and hill start assist to prevent the SUV from rolling backward when moving from a stop on a hill. Ready to check out the 2017 Chevrolet Equinox for Sale in Libertyville IL? 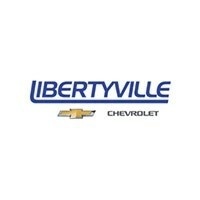 Come on over to Libertyville Chevrolet. 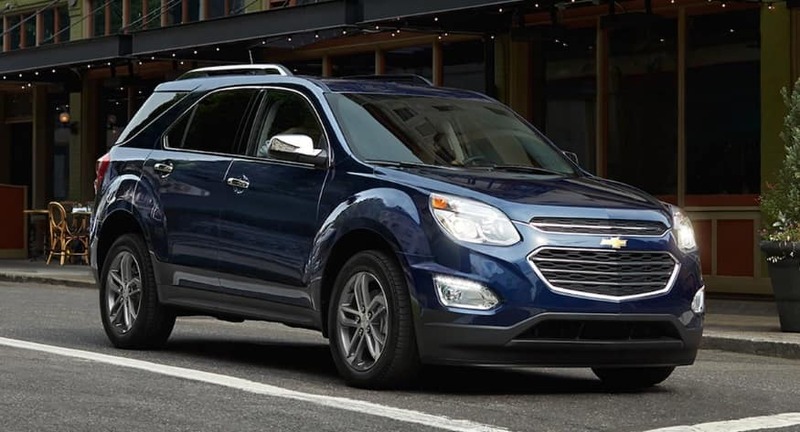 Although we are located in Libertyville, we also serve residents in nearby Gurnee and Waukegan, particularly those looking for an Equinox for Sale. Libertyville Chevrolet has been the ideal place for residents in Lake County and nearby areas in the Chicago metro area for Equinox specials. Schedule your appointment with one of our Chevrolet experts today for Equinox for Sale or Equinox specials.